We had two interesting discussions in Second Life on Friday evening and Saturday morning, as part of the IATEFL Aberdeen Conference proceedings. 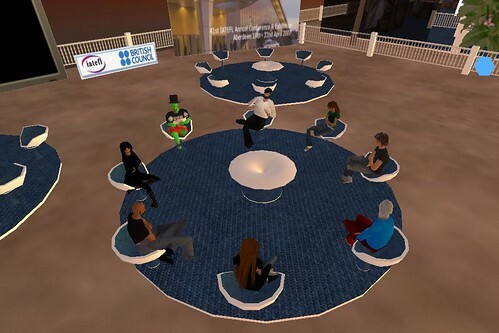 The discussions were held at Edunation, on the subject of language learning and Second Life. [13:30] Misha Writer: hi - welcome to the session! [13:30] Ingrid Lindman: Hi Kita! [13:30] Ingrid Lindman: Hi everybody! [13:31] Misha Writer: Baldric - are you here? [13:31] Misha Writer: there you are!! [13:32] Kita Coage: what will be going on then? [13:34] Misha Writer: are you suggesting the Scots are sots ?? [13:35] Misha Writer: you both did? [13:37] You: so, who wants to start? the German government language school. [13:39] Webhead Link: graham are you still holding your eflbridges skypecasts? [13:41] Ingrid Lindman: Can everybody participate in your skypecasts, Graham? [13:43] Kip Yellowjacket: That's better. [13:44] Kita Coage: your on fire! [13:44] Kip Yellowjacket: Well, I'm Kip Yellowjacket from Second Life English. [13:44] Jonny Hubble: Can I join you? [13:45] Kip Yellowjacket: My wife and I have a language school in Germany. 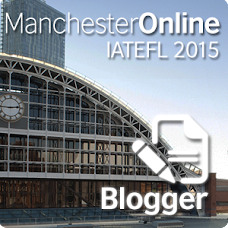 'language learning and Second Life' - can it be done? [13:46] Osnacantab Nesterov: Kip. Where in Germany? [13:47] Kip Yellowjacket: ...don't wish to pig the talk. [13:48] Kita Coage: is there an easy way to voices? - in SL? [13:48] You: what do you think it would have added, Jonny? [13:49] Webhead Link: do any of you sit in on Fire Centaur's classes? [13:49] You: but what about actual teaching of languages? [13:49] Kip Yellowjacket: I teach at the English Village. [13:52] You: kip, what kind of reaction have your students given you? [13:53] You: what do they say to you about their experience of learning in sl? about what they'd like to do? [13:55] You: it's good to use elements outside of SL then, Kip? [13:55] Bunny Barbarossa: how do you do that exactly? [13:56] Bunny Barbarossa: get feedback from them? [13:58] You: how about taking us through a typical lesson, kip? [14:00] You: how can you get more student involvement? [14:00] You: is building a good idea? [14:01] You: how did they go? [14:01] Misha Writer: can you tell us more about the marketplace idea? [14:01] You: How about communciation games? [14:03] You: what about lesson plans? [14:06] You: kip, are most of your students in SL young adults? [14:07] You: do you have any students that are not your RL students? [14:09] Kita Coage: by blog work, do mean reflections? [14:10] Webhead Link: can one drop by? [14:11] Misha Writer: that's brilliant! [14:11] Kita Coage: where at? [14:12] Bunny Barbarossa: isn't there always? [14:13] Webhead Link: how would I find the schedule? [14:15] Bunny Barbarossa: hide and seek? [14:15] You: ingrid, what did you like most about it? regular basis like in a rl class? [14:17] Bunny Barbarossa: is that the majority? [14:17] Bunny Barbarossa: linden or US? explain what that involves, Kip? [14:18] You: ok, sorry...lots of questions! [14:20] Bunny Barbarossa: what time are the classes on Friday? [14:20] Misha Writer: my question too - what time? [14:20] Bunny Barbarossa: which is GMT? [14:20] You: have you all heard of this? [14:21] You: what do you think, Kip? [14:22] Misha Writer: sims = areas in SL ?? [14:22] Bunny Barbarossa: 21 or 12 Baldric? [14:23] Bunny Barbarossa: it must be the haggis! [14:25] Kip Yellowjacket: how hard is it to teach on the teen grid? [14:25] susan Williams: where are you intending to recruit your students? space on your teen island for other projects? [14:28] Bunny Barbarossa: on the teen grid, Susan? do u have in mind? [14:32] Kita Coage: can you give an example of a function game Baldric? [14:33] susan Williams: what are you using to develop the games? baldric? (if not use) the island when it is complete? [14:36] susan Williams: how straightforward is the background check? described to the adult SL ? [14:37] Kip Yellowjacket: whats the step after that? wouldn't have to be repeated? [14:40] Misha Writer: camtasia videos ?? [14:41] You: we are going to be kept very busy! [14:42] Bunny Barbarossa: where did you get your info? [14:43] Bunny Barbarossa: from teens? [14:43] Bunny Barbarossa: I can't stop looking at them! [14:44] Bunny Barbarossa: you don't know what you're missing! bunnies!! [14:44] Misha Writer: no wonder you like them! [14:46] Bunny Barbarossa: hi kyle! [14:46] Bunny Barbarossa: didn't know you were there! [14:46] SusNy Foss: Hello ! last year on my new blog? [14:50] You: sus, do you know of anyone teaching languages in SL? [14:50] You: and could you give us an intro too? [14:52] You: what about other language learning and teaching projects in SL? This is the point where we lost the connection. If anyone was there and has the rest of the chat, please can you post it? Thanks!